It was a regular ol' hootenanny Friday evening in Cowtown... err, Chinatown. 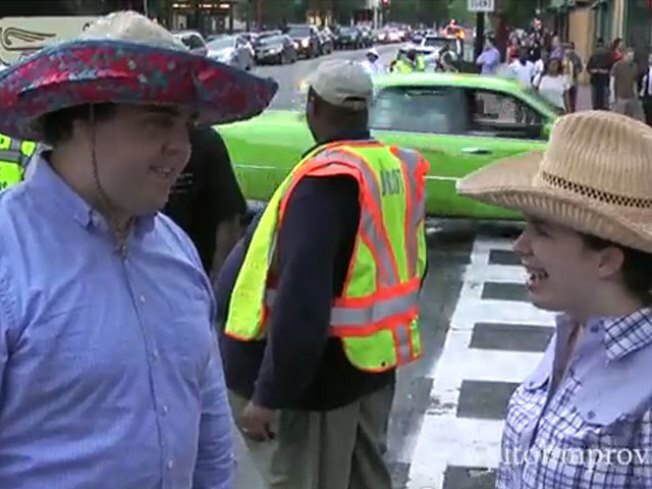 You know that newfangled di-ag-on-nuhl crosswalk them city slickers procreated down there by the Verizon Center? Well, they call it a Barnes Dance. It's a silly name for a contraption like that, but that gave some cowboys and cowgirls a good idear. Why not have a honest-to-goodness barn dance in the middle of the street? That's exactly what they did Friday, as the guys and gals grabbed a partner and went round and round -- for a few seconds at a time, at least. When the walk sign lit, the hootin' and hollerin' began. There were cowboy hats, checkered shirts and some do-si-dos. Don't believe us? Here's the video proof, thanks to the Capitol Improv and Left for LeDroit.